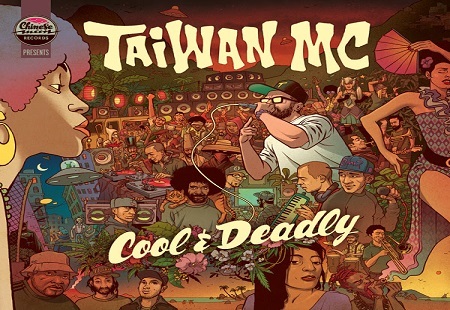 TAIWAN MC PRESENTS THE NEW ALBUM "COOL & DEADLY"
Taiwan MC is back with his LP Cool & Deadly. He has already released two EPs during his career: Heavy This Year in 2013 and Diskodub in 2014 and they really shook many sound systems; he has been collaborating with Chinese Man, DJ Vadim and Manu Digital. With this new project the artist vents his creativity with vocal and instrumental proposals and with some quite innovative collaborations. The EP includes female voices and they confer to the album an undeniable sensuality: Taiwan MC leaves the place of honor at Anouk Aiata, and Paloma Pradal. With this new album “Cool & Deadly”, Taiwan MC mixes reggae flavors, hip hop, dub and electronic music. Dopo due EP che hanno fatto tremare i sound system, Heavy This Year (2013) e Diskodub (2014), e numerose collaborazioni con Chinese Man, DJ Vadim e Manu Digital, Taiwan MC torna con il suo LP Cool & Deadly. In questo nuovo progetto Taiwan MC da sfogo alla sua creativita' con proposte vocali,strumentali e collaborazioni decisamente innovative. L'Ep vede la presenza di voci femminili che apportano all’album una indiscutibile sensualità:Taiwan MC lascia il posto d’onore a Anouk Aiata, e a Paloma Pradal. Con Cool & Deadly, Taiwan MC mescola sapori reggae, hip hop, dub e della musica elettronica.